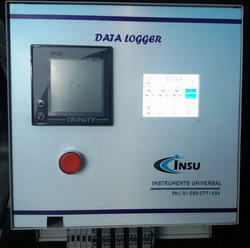 Manufacturer of a wide range of products which include online gprs pump data logger. Technically speaking, a data logger is any device that can be used to store data. This includes many data acquisition devices such as plug-in boards or serial communication systems which use a computer as a real time data recording system. However, most instrument manufacturers consider a data logger a stand alone device that can read various types of electrical signals and store the data in internal memory for later download to a computer. The advantage of data loggers is that they can operate independently of a computer, unlike many other types of data acquisition devices. Data loggers are available in various shapes and sizes. The range includes simple economical single channel fixed function loggers to more powerful programmable devices capable of handling hundreds of input. Data loggers can collect data independently of a computer. Data is normally collected in non-volatile memory for later download to a computer. The computer does not need to be present during the data collection process. This makes them ideally suited for applications requiring portability. Data acquisition systems offer a great deal of flexibility and are certainly attractive when high sample rates are required, however, since they require connection or installation into a computer, the computer must also be present and active when collecting the data. B. Touch Screen keys input. Powder coated with 7 tank process with 16/18 Gauge cabinet. Packaging Details: Export packing available, as per requirement.